Happy Monday everyone! Hope you all had an awesome weekend. Today, I'm sharing my last look of my Valentine's Day outfit series, which is by far the most glamorous. If you missed my previous looks you can check them out here and here. What's one thing every girl needs in her closet? Well, a tulle skirt of course, to make her feel like a total princess for the day - am I right? To bring you this stunning tulle skirt, I had the pleasure of working with an amazing Canadian based company, called Pastel Dress Party. I must admit at first I was a tad nervous stepping out of the house sporting this skirt. It's not everyday you see someone walking around in a tulle skirt, at least not where I live. But then, I decided to just embrace it, and enjoy the moment. By the end of the shoot, I didn't want to take it off! A tulle skirt is already a statement piece in itself, but I wanted to glam mine up a bit more. To give the overall look a modern, retro glam feel, I paired the tulle skirt with a pair of deep red bow velvet heeled sandals, a navy/pink top, a metallic clutch, and 2 separate faux leather bracelets. With Pastel Dress Party you have the option to customize the length of your skirt, or you can choose from their standard size. I wanted my skirt to be slightly longer than the standard 26", so I got mine customized. I hope you ladies leave this post inspired to try a tulle skirt for yourself. There are so many other ways to wear a skirt like this, which I hope to create in future posts. *This review was done in collaboration with Pastel Dress Party. However, as always all opinions are my own. You look stunning! This is one of my faves looks from you, gorgeous. How stinkin' gorgeous do you look?! Obsessed with that tulle skirt! This has to be one of my favorite looks! Awe thank you so much Kelly! Too kind of you:-). I'm so glad you love the look! 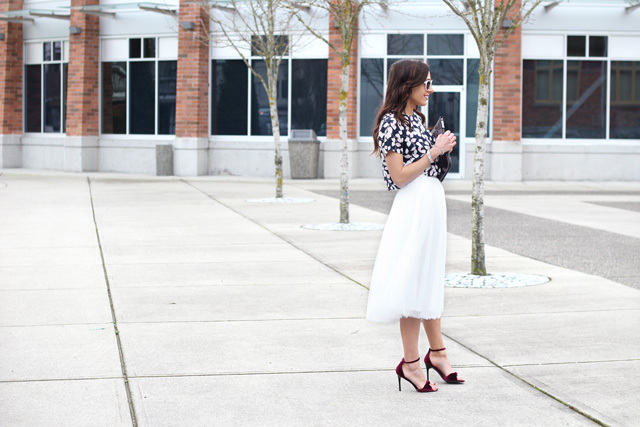 A tulle skirt is perfect for feminine looks! This looks lovely with your top too! In Love with your outfit and your pictures are fabulous! This just might be my favorite outfit of yours yet! I love your tulle skirt! It looks fantastic with your top and heels! My favorite Valentines look of yours! You look like a pretty princess. This tulle skirt is absolutely darling and I love the heels your paired with it. Perfection! Thanks so much Amanda:-). You would look so good in this skirt! Thank you Janna! And again thank you so much for featuring me on your blog during your Valentine's Day outfit inspiration. You're too fricken awesome! The shoes on sale definitely makes the purchase a lot more satisfying:p. I'm glad you agree;). Ahhh still working on my photography.. I always have sooo many questions... I wish we lived close to each other so we could go out together. Your photography is always on point! You need to teach me some tricks. Have a great week Janna! Hahaha it definitely was! Not like I have many places to wear it, so maybe I will just walk around with it at home LOL. I'm seriously obsessed with this look! You look amazing! I've always wanted a tulle skirt, I think I need to get one asap! What a perfect Valentine's day outfit. Your top is too cute, and I love how you paired it with the wine colored heels! This is such a gorgeous look!!! This is such a beautiful shot! I love how fresh and warm it is! Have a great v-day, babe! obsessed with this look! you look so chic and gorgeous! Thank you Katelyn:-) So glad u liked the post and hope u had an awesome Valentine's Day! Thank you Kavya! Always so sweet:-). I loved ur post on your mint tulle skirt with your leopard sunnies. Hope u have an awesome week and thanks for stopping by! I love tulle skirts, they're perfect for holidays like Valentine's Day too! The length is so pretty on you, it was smart to get it a bit longer. Love this retro look & your edgy look as well! Gorgeous as always! Thank you so much Dominica! I'll definitely be visiting your blog:-). Thanks so much for stopping by! Everything about this is outfit is so fabulous! I am in love with this chic look! I love how you paired the floral print with tulle skirt, and I ADORE the pop of bold bordeaux color in your heels! i love tulle skirts! this look is amazing! You look so chic and I love your tulle skirt Ela! So whimsy. Have a great Valentine's day! I love this look! Those heels are perfect for Valentine's Day!! Love those shoes -so pretty! You look stunning! I love that skirt. The top is amazing. You are rocking this look. Thank you Ruthie! You always make my day:-) Have a great week! Ela, so so sooooo chic and feminine. I'm in LOVE with this. You look sooo gorgeous! This is stunning! Love it! Hope you have an excellent weekend and Valentine's Day!!! Love this outfit, so sophisticated! Such a great look, Ela! You look so stunning!! Tulle and florals are somethings I've been wanting to style for spring for so long and I love how you did it! Gorgeous!! Thank you Tivoli! I hope you end up styling it for Spring! I would love to see it:-). Have a great week! How did I miss this post earlier this week?! This tulle skirt is perfect for Valentine's with your printed top and red heels. Babe!! Thanks Amy! Ah no worries! Life get's hectic and I totally understand. I always appreciate u coming by. Have an awesome week! This look is BEYOND stunning! I love this outfit from head to toe:)! Styled to perfection! Ela, this pairing is just beautiful! I adore each piece, especially those romantic shoes!!! Great styling, as always, gorgeous, and thanks so much for the inspiration! Thank you Jalisa! I was happy to find them and of course best part is them being on sale!:-). You look so beautiful in this tulle skirt. So flow and feminine. It's definitely a keeper!